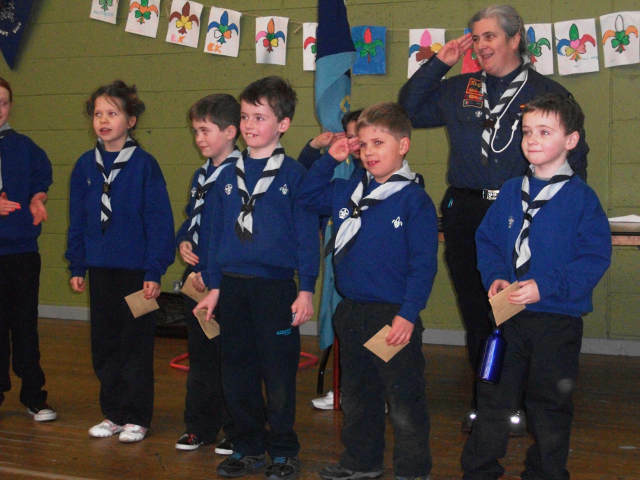 Welcome to the Beaver Colony of the 175th Dublin Scout Group, Castleknock! We meet up every Wednesday from 6:00 to 7:15p.m. in the hall of the Diswellstown Community & Recreation Centre, St. Patrick's National School, Distwellstown Road. Beaver Scouts are aged 6 to 8 years. The grown-up Scouters who look after the Beaver Scouts are known as 'Elders'. Each weekly meeting is a different adventure. We are presented with lots of challenges to help us to learn new things and to build on the abilities we have. We learn scouting skills like how to read a map or pitch a tent. We put our arts 'n crafts skills to good use making interesting things to help us in our meetings. And, of course, we play lots of games. If the weather is nice we like to go outdoors. We wear our Beaver Scout uniform (sweatshirt and dark trousers) at meetings, while on activities and for other official occasions. Every so often we go on 1 or 2 day outings at weekends. These give us a chance to really put our scouting skills into practice. We work up to the most exciting event of our year, annual camp. This is when we get to take part in exciting activities all day and sleep in tents.